Born in 1991, it wouldn’t be long before Trenton would go on to discover a deep connection and natural talent for music at an early age. Listening to some of the best-of-the best and gaining influence from artists & bands like Eminem, Tech N9ne, Luda and Maroon 5, young Trenton P began to create his own rhythms & rhymes and put his mind to pursuing a dream of a lifelong career in entertainment & music. Testing his skills where it matters most - right on stage in front of the fans; Trenton established a reputation of excellence in front of concert attendees in St. Louis that spread larger with every performance. His charismatic & electrifying performances and his lyrical-flows & intense freestyles stunned local crowds - and it was their support and confirmation that led Trenton P to take it all to the next level and bring the music straight to the people. First entering the studio in the winter of 2011 at twenty years old, Trenton P grabbed the mic and began to immediately feel at home. Comfortable and professional but always hungry to learn and be the best, he was already recording solo records by 2012 and had released the hit-singles “I’ll Be The Best” and “Can You Hear Me Now.” The instant buzz surrounding his new music hit the streets hard and word began to spread even more quickly about the intensity, passion and all-out entertainment you could find in Trenton’s music & live shows. By 2013 his fan-base had massively expanded in growing support for his creative and clever twist on rap & hip-hop - and by 2014 he broke the internet with the release of his second solo project, Remember The Name. And according to internet music-charts and reactions from all over the globe, the people DID Remember The Name; they did through the music and they did through his video-work. 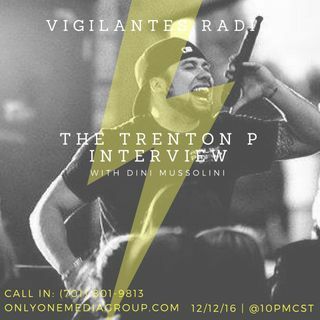 Involved in all-aspects of his music & career and driving his music forward with full-speed, Trenton took on a ton of radio-interviews and continued a long-time collaboration with filmmaker/videographer HollowWear. The result of his hard-work & effort showed itself once again with videos from Trenton P racking up tens-of-thousands of hits and finding a staggering nearly quarter million views in total online. The buzz and impact of Trenton P was undeniable. In full-on beast-mode - Trenton P released his most incredible set of tracks to-date with his third album SO ILL. With his signature style, approach and edgy, thought-provoking lyricism he’s become a sonic-force in the rap-game armed with an unstoppable work-ethic determined to be the best by outworking the rest. SO ILL took in thousands-upon-thousands of pre-orders and has since gone on to quickly impress critics and fans alike through the intensity of the vocals and the massively-dynamic beats Trenton P cut for his third record. The momentum continued to increase. SO ILL proved to be a huge breakthrough album for Trenton P and opened the door for tremendous new opportunities for his music and career. While radio-play in across the border in Canada grew and expanded to feature his music on over ninety stations, SO ILL also made gigantic strides in the USA, reaching inside the top-ten all throughout the nation securely at the #8 spot on the CMJ charts. Keeping the hype strong and the crowds screaming for more, he played shows on stages set all throughout the country while his YouTube channel gained over 300K hits and a half-million more listens through the Pandora music-site. The people connect with the music Trenton P makes…they hear the hunger, the determination and the skills that set him apart from the rest each time he hits the mic. Inspired like never before, he signed himself to his own label on the SO ILL Music Group and is seizing the momentum and buzz around his music, ready to take it all to the next-level. Branching off the success of SO ILL, the man is currently hard at work writing, refining and recording a whole new set of songs being set for release in October 2016 on a brand-new album. Continually challenging himself and pushing himself to be the absolute best around - Trenton P makes sure that his best work is his current work each time out, and So ILL set the standards up higher than ever before. The new album coming in January is called Blacklist and features an incredible cast of supporting talent all willing & ready to assist Trenton P with bringing his new tracks & vision to life. Making certain that each move he makes is a step forward in the right direction towards the top, Blacklist is sure to be loaded with big-beats and intricate rhymes that contain all the ingredients necessary to make an epic impact on listeners once again and establish Trenton P as a recognizable force in modern-day hip-hop as he takes over 2017.